Eagle Speak has the latest Office of Naval Intelligence "Worldwide Threat to Shipping" which includes a summary of upcoming anti-whaling activities. The International Maritime Bureau expresses optimism over the as the number of pirate attacks has decreased for the third straight year. Marketplace.org has how the shipwreck of the MSC NAPOLI, which was carrying a thousand tons of nickel, has affected global nickel prices. FIN24 (South Africa) reports that over 80% of the cargo on the MSC NAPOLI was bound for South Africa. 130 of the containers contained parts for a Volkswagen factory there which now will have to cut back production since the parts will not be arriving 'just-in-time'. France's Préfecture maritime de l'Atlantique has a series of photos of the MSC NAPOLI. Sailors, Mariners & Warriors League has the grounding of the NIJORD in Latvia where it turns out that 5 of 9 members of the crew were intoxicated. Helsingin Sanomat covers the "Big cost overruns for Vuosaari harbour transport infrastructure." Vuosaari is Helsinki City's new Port Terminal. Divester has the "USS ARIZONA is Wasting Away"
Freaque Waves has the loss of the fishing vessel OCEAN CHALLENGER to a freak wave. Mary Katharine Ham at Townhall has a photo of the tombstone of US Navy sailor Edward J. Caffrey who died during WWII in '1944'. Marex Newsletter has the rejection of plans to put a LNG Terminal at Long Beach Harbor. The West Coast still has no LNG Terminal. Greenpeace's Ocean Defenders has video taken by New Zealand's Air Force of Japan's whaling fleet operating in the Ross Sea off Antarctica. Antarctica 2007 prepares for the arrival of the annual resupply ship at the US's McMurdo Station. New Zealand's Environment Minister has decided that Japan's whaling vessels are not welcome in his country. He has also asked all sides to use restraint during this year's protests. 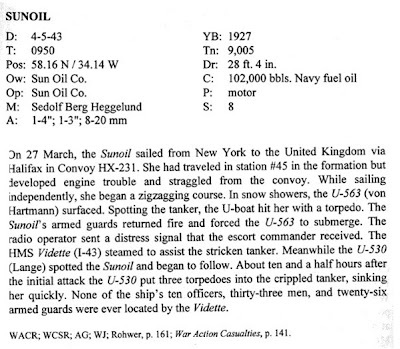 The Stupid Shall Be Punished has the discovery of the submarine USS PERCH, scuttled during WWII. The Conservation Report notes Greenpeace's fears of overfishing due to liberalization of trade. Lexacat's Guide to the Doom has the UK's illegal exports of garbage to China, disguised as recyclable waste. 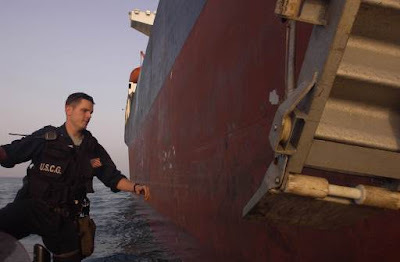 USCG – draft MMC documents - The US Coast Guard has posted on the Internet draft copies of sample merchant mariner credentials (MMCs). 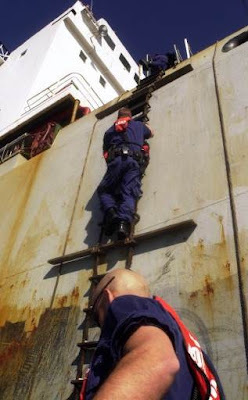 The MMC-STCW would be for US mariners who may sail foreign or otherwise need evidence of their STCW qualifications (note the current draft of this document consists of 3 pages, but should be only 2 – the front and back of one piece of paper). The MMC-domestic would be for US mariners who don’t need evidence of their STCW qualifications. The MMC-continuity would be for US mariners who want evidence of their continuity of capability, but it is not valid for service. The MMC-passport style would be for US mariners desiring a document compatible with a standard passport. As noted in yesterday’s newsletter, the Coast Guard is proposing that the current merchant mariner documents (MMDs), licenses, and certificates of registry (COR) be replaced by MMCs and used in conjunction with the TWIC. (1/25/07). DC Protesters: "Withdraw Now. Cut and Run Later"